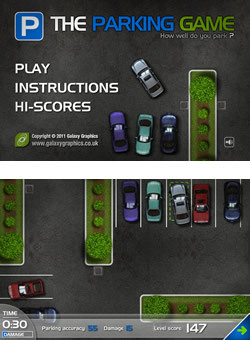 The Flash Parking Game, a rebrandable driving game by Galaxy Graphics. How well do you park? Another driving game suitable for all car, driving and auto-parts related marketing campaigns, plus many others. The Parking Game is simple to understand, just accelerate, brake and steer your car until it fits roughly or exactly into the area indicated, then press space to calculate your score. The end total is your score from each of the 5 tricky levels. If you are interested in licensing this parking game for your own site, or a custom rebranded variant of it, please contact us for more information. Looking for the parking game's source code / Actionscript 3.0 / .fla file ? The source code for this game is also available to buy from Galaxy Graphics. Click here to contact us about Parking Game source code.